Join uOSFL at the March for Life and NCLN Dinner! Join your favourite pro-life student club at the March for Life! We will be congregating on Parliament Hill betweenа noon and 1 pm. You will be able to recognize us by our enormous banner. The March itself begins at 1:30 pm and lasts for about an hour. For more information on the March and related events, see the official page. Later that day, at 6 pm, there is Life & Justice: The 3rd Annual Campus Pro-Life Student Dinner, organised by the National Campus Life Network. It is an opportunity for students (and some of their non-student allies) to come together for an evening of food and fellowship as we celebrate the accomplishments of campus pro-life groups and look to the upcoming school year. The evening will feature student testimonials as well as a review of the student pro-life movement in Canada over the past year, and also a delicious buffet! It will take place in the hall of St. Theresa Catholic Church at 95 Somerset St. W. (St. Theresa’s is in the downtown and only a 20 minute walk from Parliament Hill). Tickets are $20 for students and $30 for non-students; if you would like a ticket, you can contact Rebecca at director@ncln.ca. Click here to see the official poster. We hope to see you all there! This entry was posted in events, for your information, uOSFL and tagged March for Life, May 12, NCLN, NCLN dinner, Ottawa on May 3, 2011 by uOttawa Students For Life. Yes indeed my friends, it is once again time for the National March for Life. Tomorrow (being the 13th of May), we will show our fellow Canadians what our pro-life community is made of. For the official agenda, see here. For the uOSFL version, keep reading. Now, as you may have guessed, the March for Life involves marching, so I recommend wearing comfortable shoes and bringing water. Tomorrow is supposed to be sunny with a high of 17°, so umbrellas and coats may be unnecessary but you may want to bring hats and sunglasses. The March itself begins at 1:30 pm, and may last about an hour. After the March, you may recuperate from the strenuous journey through the streets of Ottawa. This, then, is the plan. We will be meeting on Parliament Hill at 12:00 noon. The club will be meeting at the halfway point between the Centennial Flame and the southeast corner of the lawn. So: if you are at the Centennial Flame, facing the Peace Tower, turn right and walk towards the East Block; you should bump into us about halfway across the lawn. We can be recognised by our enormous banner. We encourage all students from the campuses to meet up with us by 1:15pm (just before the march starts) so we can all march together! 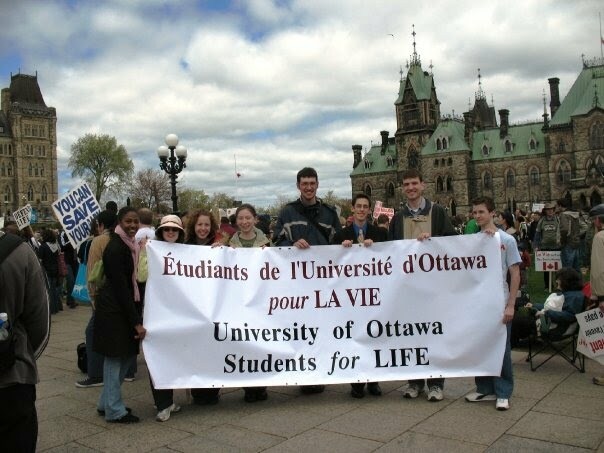 This entry was posted in events, uOSFL and tagged abortion politics, activism, advocacy, by Dante, March for Life, Ottawa, politics on May 12, 2010 by uOttawa Students For Life. Famed astrophysicist Stephen Hawking recently claimed that “intelligent alien life forms almost certainly exist.” This led me to wonder what aliens would think about a debate we are having here on Earth. As I follow the controversy surrounding the G8 maternal and child health initiative, at times I feel like I might be living in a parallel universe. The Canadian government’s decision not to include funding for abortion in its plan to help save the lives of the world’s most vulnerable mothers and children continues to elicit outrage from some. Over in my parallel universe, it is incomprehensible that ending the lives of unborn children in impoverished nations would constitute humanitarian aid. Hunger, disease, violence, war – sadly, these are all-too-present in developing countries. But how does it follow that we can help others by promoting death as a solution? Because that is what opposition to abortion boils down to: abortion is wrong because it kills a human being. It doesn’t matter whether a pregnant woman is Canadian or Congolese: the child growing inside her has a right to life. An abortion is an act of violence, and the countries the G8 initiative will help certainly don’t need more of those. Women the world over need to find compassionate support when they look for help during a crisis pregnancy, not an offer to abort their baby. Sometimes it’s easy to think that few people inhabit my parallel universe. The National March for Life is an excellent opportunity to see that that is not at all the case. On May 13th, thousands of people will gather on Parliament Hill to march through the streets of our nation’s capital and be a voice for the voiceless. If you live in the Ottawa area or can make the trip, I strongly encourage you to come to this important event. Who knows, you might even meet a friendly uOSFL earthling! This entry was posted in abortion and tagged abortion politics, advocacy, by Marissa, events, March for Life, Stephen Hawking on May 1, 2010 by uOttawa Students For Life.